This can be found on the front of any documentation we send. Has this person been previously monitored? 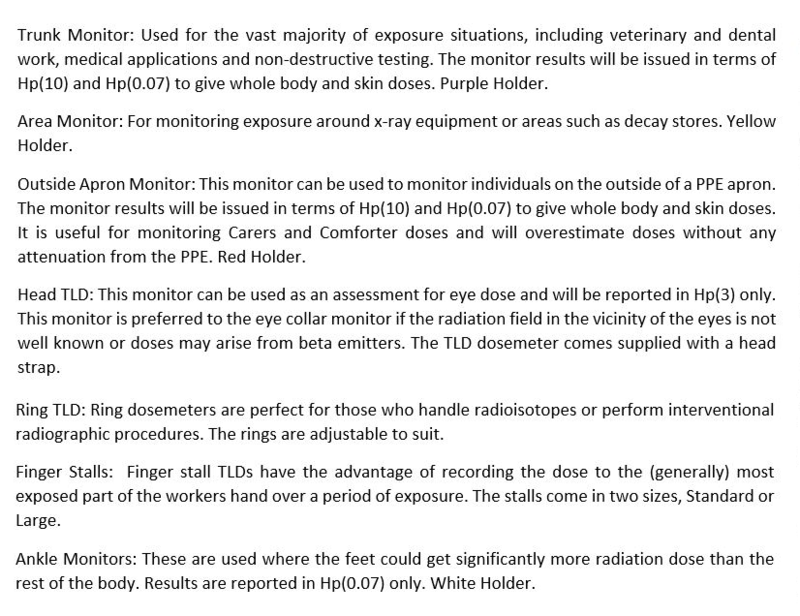 Please provide details of the Dosimetry Service which provided the monitoring. Is this person 18 years of age or over? Is this person a Classified Worker? Please note: You should receive your dosemeter/s within 7-8 working days of your request. If you require dosemeters earlier please select 'Yes' in the Immediate Issue drop-down box - you will receive your dosemeter within 2-3 working days. There will be a surcharge of £2 for the latter. Please click on the help button below for an explanation of the different types of dosemeter, and how to determine your requirements. If holders are requested, default holder colours are issued unless you tick the box for MRI compliant holders. Please request holders only if you have insufficient for the number of wearers within your department. We allow you to hold a small number of surplus holders but you will be charged for any holders not returned at the end of your contract. Ring Dosemeters are adjustable. Stalls are available in two sizes. Personal information provided on this form is treated in confidence and in accordance with the Data Protection Act 2018. The information will be used to enable the supply of personal radiation dosemeters and prepare individual radiation exposure records. We may share information with selected third parties in fulfilling these obligations. Information will not be utilised or shared for any other form than for the purpose for which it is collected and will be kept securely within the terms of the Act. Trunk Monitor: Used for the vast majority of exposure situations, including veterinary and dental work, medical applications and non-destructive testing. The monitor results will be issued in terms of Hp(10) and Hp(0.07) to give whole body and skin doses. Purple Holder. Area Monitor: For monitoring exposure around x-ray equipment or other designated / non-designated areas. Yellow Holder. Outside Apron Monitor: This monitor can be used to monitor individuals when worn on the outside of a PPE apron. The monitor results will be issued in terms of Hp(10) and Hp(0.07) to give whole body and skin doses. It is useful for monitoring Carer and Comforter doses and will overestimate doses without any attenuation from the PPE. Red Holder. Head TLD: This monitor can be used as an assessment for eye dose and will be reported in Hp(3) only. This monitor is preferred to the eye collar monitor if the radiation field in the vicinity of the eyes is not well known or doses may arise from beta emitters. The TLD dosemeter comes supplied with a head strap. Eye Collar Monitor: This monitor is worn on the collar for assessment of eye dose and will be reported in Hp(3) only. This is only suitable for assessing eye dose when the radiation field is known to be the same at the collar and the eyes and the radiation only consists of photons e.g. interventional radiology. Red Holder. Ring TLD: Ring dosemeters are most commonly used by those who perform interventional radiographic procedures and those who work in nuclear medicine to monitor extremity doses. The rings are adjustable to suit. Finger Stalls: Finger stall TLDs are most commonly used whilst handling radionuclides. They have the advantage of a more accurate assessment of dose to the fingertip. The stalls come in two sizes, Standard or Large. Ankle Monitors: These are used where the feet could get significantly more radiation dose than the rest of the body. Results are reported in Hp(0.07) only. White Holder.